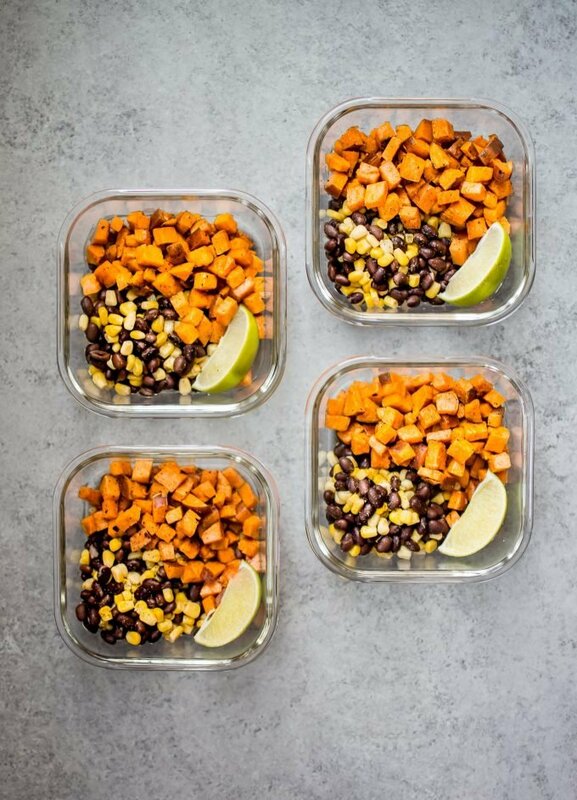 These southwest sweet potato vegan meal prep bowls are a healthy and efficient meal prep idea. You can have 4 delicious meals ready in under 45 minutes! Meal prep is everywhere these days. People are searching for it, so I’ll happily make it. To tell you the truth, I’ve done “meal prep” my whole adult life pretty much. I thought that cooking a large meal on Sunday so you’d have lunches for the week was a fairly common thing to do. A lot of the meal prep nowadays is focused on not only saving time but on particularly healthy recipes. This one falls into that category. I meal prep to ensure that I’m eating healthy food that isn’t loaded with hidden calories, and because I spend more than enough money on food already haha. 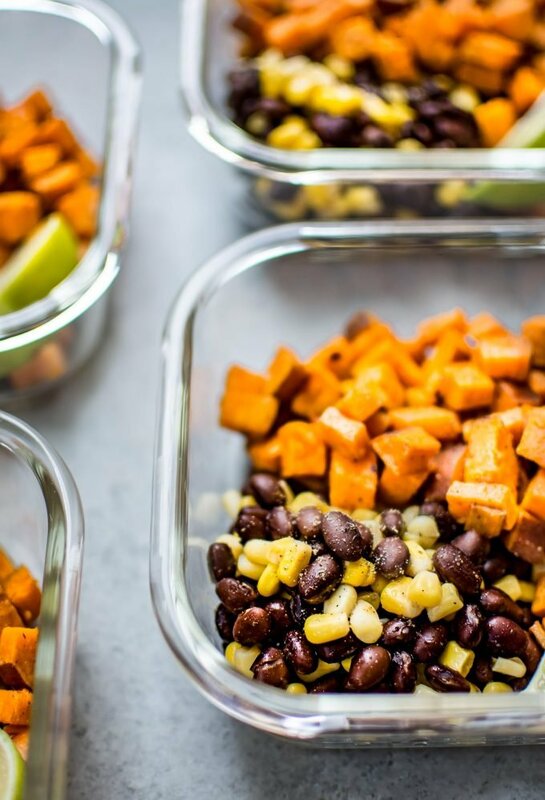 Let’s talk about these easy sweet potato meal prep bowls. I kept it pretty simple with roasted sweet potatoes, black beans, and some sweet corn. Meal prep doesn’t have to take up half a day. We’ve got carbs, protein, plenty of vitamins, and a lot of flavor in these bowls. I also considered adding some sort of grain like brown rice but decided against it. I’d rather have more sweet potato. 😀 It’s totally up to you if you want to add it. I actually photographed this recipe during the eclipse. I had the day off my office job, so what else would I be doing besides photographing food? 😛 I considered making a video that day, but luckily I talked myself out of it. The light was so strange… it was a brilliant blue sky without many clouds, but it was still very dark in my place. Luckily the photos didn’t turn out too badly, and thanks to the magic of editing software, I was able to brighten them up considerably. I can’t believe it’s September 1 already! I’m not one of those people who look forward to fall, unfortunately. I am 100% a hot weather person. I could completely do without winter. …Crappy for me since I live in snowy Edmonton!! 😛 We try to make winter a bit better by traveling more, but I’m already looking forward to spring. On that downer, let’s get back to meal prep. I usually meal prep 3-4 lunches on any given week. Part of the reason is that I’m somewhat paranoid about food safety, so I don’t like stuff sitting in the fridge for very long, and the other part is that I get bored of eating the same thing day after day. I ended up eating 3 of these for work lunches, and my husband had one for dinner one day. I enjoyed them cold, but you could also give them a quick zap in the microwave if you wish. I think you could easily stretch these out for 5 days if you had 5 containers and a particularly large sweet potato since they’re basically just full of vegetables. Totally up to you! The flavors in these vegan meal prep bowls are definitely lively. I particularly enjoyed squeezing that wedge of lime onto everything prior to digging in! The sweet potatoes are tossed in southwest seasoning, a bit of garlic, olive oil, and salt & pepper, then roasted to perfection. I cut them up pretty small, so they were done after only 25 minutes in the oven. Easy peasy. The corn and beans are tossed in some lime juice and olive oil. The southwest seasoning is a little spicy, but I’d say these healthy meal prep bowls are more flavorful than spicy once you’ve got them all assembled and sprinkled with lime juice. If you liked this recipe, you may also like my vegan Thai sweet potato coconut curry (it makes awesome lunches that re-heat well! ), my healthy stuffed sweet potatoes (not meal prep but they’re delicious! ), my spinach and quinoa vegan meal prep bowls, or my vegan Mediterranean meal prep bowls! I also have a roundup of 30 vegan meal prep recipes if you’re looking for more inspiration. These vegan meal prep bowls are efficient and delicious. 4 meals ready in under 45 minutes! Preheat oven to 400F and move the rack to the top third of the oven. Prep your sweet potato (I didn't peel mine, but you can if you want to... rinse it thoroughly if you're not peeling it) and add the cut-up pieces to a foil-lined baking sheet. Sprinkle the pieces with the southwest seasoning, garlic powder, and salt & pepper, and toss with 2-3 tablespoons of olive oil. You want each piece coated in oil but not dripping with it. Bake for 25 minutes or until tender. Meanwhile, add the corn, beans, lime juice, 1 tablespoon of olive oil, cumin, and salt & pepper (optional) to a small bowl. Toss. Once your sweet potatoes are done, equally divide them and the corn/bean mixture between the four Tupperware containers. Add a wedge of lime to each container. I suggest eating the meal prep bowls within 5 days. These bowls can be eaten cold or hot. Take the lime wedge out prior to microwaving. Customization ideas: add rice or quinoa if you wish, and/or add some sliced avocado just prior to serving. If you want to add some extra protein, tofu would work well. If you're not vegetarian/vegan, chicken would be a good addition to these bowls. These are the glass containers I use. Looks & sounds easy & delicious! I’m not really loving the canned corn though so I’d use fresh or frozen. Is there a reason for the canned corn or is it just your preference? Same with the garlic powder, I just can’t stand it. I could add fresh minced garlic but just had another & perhaps better idea. I like infused oils & need to refresh my garlic infused olive oil soon. Since you’re using olive oil in the recipe anyway, why not replace the garlic powder & evoo with the garlic infused evoo? You’ll still save time (which I’m assuming is the reason for the powder) because the oil is already made & in your pantry. Infused oils are a separate prep & I find that 2 days is fine for good flavor. What do you think of that? Thank you so much for sharing!! These bowls are an excellent idea for a takeaway meal. I can prepare them and take them with me whenever I am travelling, Excellent recipes, Natasha! Thank you!! Hope you enjoy them. Oops! I realized too late that the Southwest seasoning was not a recipe but a McCormick’s product 🙂 I substituted this recipe http://emerils.com/120647/emerils-southwest-seasoning (cut in half) and used 1 tablespoon. I did not add garlic powder or salt & pepper because it’s already in the seasoning recipe. It turned out great. Thanks for the easy weekday idea!! Thanks for the recipe. I didn’t realize it was mccormick’s either. I mix up a bunch of spices for theses types of recipes. This is a good spice mix. If not in there and because this is with sweet potatoes I think I’ll grate a little nutmeg too. Great, yummy, and simple recipe! Even as a super slow cook, this took me only about 30-40 minutes total. The only comment I would make is that this was more like 2 servings for me (I like having big lunches at work to get me through the day!) and I would double the recipe for 4 servings. Hi EK! So glad you enjoyed it. Yeah, serving size can definitely be subjective. How long do they stay good in the fridge for ? Or can you freeze one meal? Hello! great recipe, do you have the nutritional values?? Hi Claire! Thanks! Unfortunately, I do not. I am not a trained nutritionist, so I don’t feel comfortable providing nutrition info as it may not be accurate. Calories will vary depending on the exact ingredients you use (e.g. size of sweet potato). Plugging the exact weights/measurements of the actual ingredients you use into one of the free calculators out there should give you a general idea of the calories.